Attention Girls! 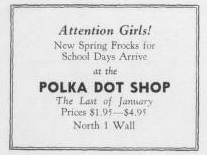 New spring frocks for school days arrive at the Polka Dot Shop the last of January. Prices $1.95 - $4.95.